On the third day of Hunger Action Week, nonprofits open their doors to the public. A collection of paper plates hangs on the wall at United Church Outreach Ministry in Wyoming, Michigan. 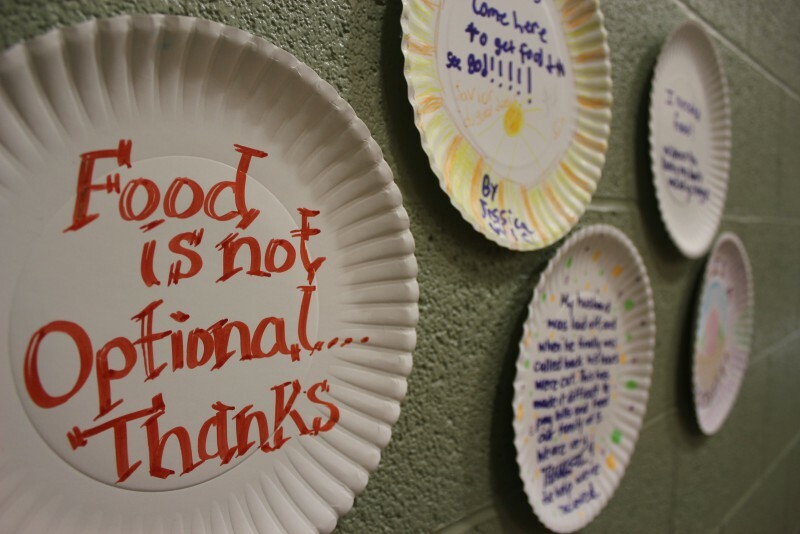 Each plate tells the story of an individual or family who depends on UCOM’s food pantry. Some are strikingly honest — “One of the worst feelings is when your child says he/she is hungry and there is nothing (underlined twice) to eat.” Others are decorated with suns, flowers, and beaming families. One simply reads, “Life without the food pantry,” and shows a stick-figure drawing of a crying girl. All of them remind the viewer that hunger touches real people in diverse circumstances. On Friday, Sept. 7, Hunger Action Week 2012 takes participants to the front lines of hunger relief with Nonprofit Approaches to Poverty, a day of agency open houses across Kent County. Visitors will tour the facilities of food pantries, health clinics and a food distribution center to learn how nonprofits actually tackle poverty and its symptoms. Visitors to participating food pantries will also get to take in the personal stories displayed in the Paper Plate Project. By bringing visitors into Kent County agencies, Rosauer hopes will they find practical ways to put their knowledge to use as donors, volunteers or advocates for struggling West Michiganders. Poverty, food insecurity and their related policy issues (one timely example being the likely reductions to SNAP contained in the next Farm Bill) cease to be abstract statistics. They become personal. The agencies taking part in Nonprofit Approaches to Poverty range from large-scale operations like Feeding America West Michigan Food Bank in Comstock Park to neighborhood pantries like John Knox Community Food Pantry in southeast Grand Rapids. A full list of open house sites and times can be found on the Hunger Action Week Facebook page.